Star of the East! That's the name of one of the best value restaurants in the 10th arrondissement, if not in all of Paris. If you're looking for haute cuisine, or stylish décor, there are better options in town. But if you're looking for value, look no further! Their set menus are a great deal: starter, main course, dessert for €16.90! If you add 25cl of wine (e.g. Bordeaux) it'll cost you only €2.00. And if you're in the mood to lubricate the evening even more, your apéritif and digestif will set you back a mere €1.50 on top of that. And the options on the fixed menu are quite varied. 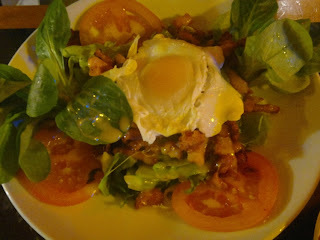 The starters include shrimp and avocado salad; bacon with poached egg; cheese and gizzard salad. The main courses are equally tempting: rump steak with pepper or blue-cheese sauce; fillet of salmon in a sorrel sauce; knuckle of lamb in calvados; filet mignon of pork with pineapple. The desserts, on the other hand, are a little less adventurous: apple tart, crème brulée and a couple of other classics. If these options don't suit you, there is also the possibility to order à la carte. There are many different cuts of beef, duck and fish available, all at reasonable prices. The restaurant is run by a couple — monsieur in the kitchen, madame serving tables —and is open Monday to Saturday for lunch and dinner. 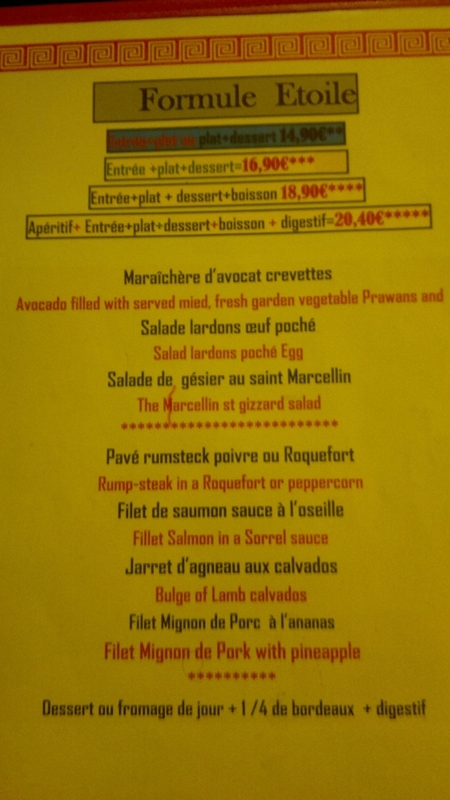 €20.40 Aperitif, starter, main course, dessert, drink, liqueur.